York, ME: Dale G. Ober, Jr (54) died peacefully, surrounded by loving family and friends, on April 4, 2019 at Gosnell Memorial Hospice House in Scarborough, ME. His life began in historic Concord, MA. Shortly thereafter, Dale’s family moved to Durham, NH where he enjoyed childhood friendships, skiing, Boy Scouts and Oyster River baseball and hockey. Upon graduating from high school, he joined the US Navy to achieve 2nd Class Petty Officer serving as an Electrician on the USS Iowa BB-61 and French translator at ports of call. He was honorably discharged from active to reserve status after 4 years of service. Dale returned to Durham, NH to graduate from the University of New Hampshire with a Bachelor Science in Resource Economics. He parlayed these skills to form a successful home and small business maintenance company in Colorado while pursuing hiking, skiing, and fishing adventures in the Rocky Mountains with friends and family. A seminal transition occurred when Dale moved to New Mexico to accomplish his lifelong dream with Mesa Pilot Development to become an Airplane Pilot with multiple ratings, including private/commercial pilot and instrument/multi-engine/air transport ratings. 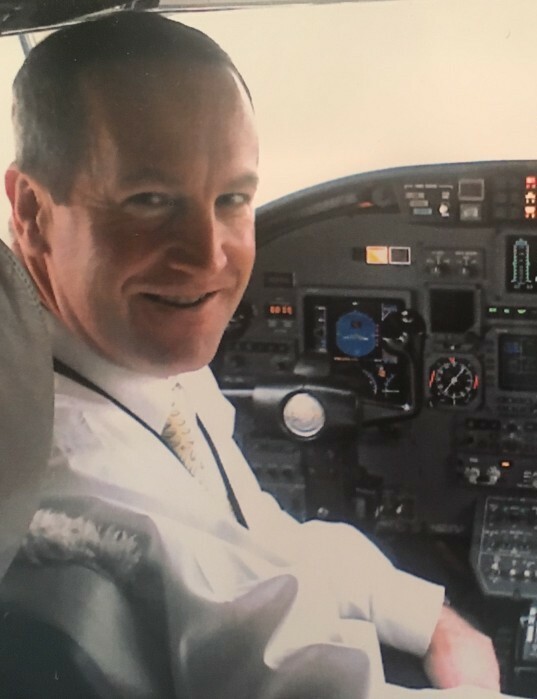 He enjoyed a rewarding career as a First Officer then Captain with both regional jet and fractional airlines prior to the pinnacle of his career JetBlue Airlines; as its core values of safety, caring, integrity, passion and fun, reflected and resonated with Dale’s own values. He developed important collegial friendships during these decisive years. Dale is survived by his wife, Caroline and son Henry, whom Dale provided terrific travel adventures, remarkable sports tutelage, and super multilevel sports patronage. Mookie, a whirling-dervish Boston Terrier, provided sensational comfort and companionship during Dale’s active treatment and convalescence. Dale enjoyed innumerable memorable times at the mountains, lakes and beaches with his friends and family, including parents, Dale and Carol Ober of Durham, NH; brother Jeffery Ober and partner Meredith Vail of Rochester, NH; sister, Mary Beth (Andrew) Schlieder and son, John of Newmarket, NH; and John Messler and daughters, Carole, Kate, and Sara of Durham, NH. Dale’s transcontinental friends and family are numerous; he spoke of them frequently with fond importance. Sadly, Dale was predeceased by his sister, Patricia Ober Messler, and grandparents, John and Mary Coughlin, Henry Ober, and Elisabeth Ober Anderson. Family members appreciate and thank the health care providers of the Seacoast Cancer Center, Brigham & Women’s Thoracic Care, York Hospital, and Hospice of Southern Maine Gosnell Memorial Hospice House for their expert, compassionate care across the trajectory of Dale’s health continuum. Importantly, embedded family, friends, colleagues, and teachers provided essential support to Dale, Caroline, and Henry to facilitate optimal holistic care. Memorial service schedules will be forthcoming. As an expression of sympathy and in lieu of flowers, memorial contributions may be made to the Special Olympics, the Jimmy Fund, the York Fire Department or York Ambulance.